In computational biology we typically have p≥3 sets of data points P1,P2,…,Pp (e.g., sets of different biological objects including proteins, genes, drugs, diseases etc. with |Pi |=ni and for each pair i < j we have a data matrix Dij containing relations between data points from Pi and Pj (intertype connections, e.g., drugs-genes), while for i = j the data matrices Dii contain intra-type connections (e.g., gene-gene, drug-drug interactions). Quite some effort has been devoted to solve this hard optimization problem, mainly using Fixed Point Method. We will use best existing academic code and parallelize it within C++ and OpenMPI and test it on a local HPC machine. Results will be tested on real data from biomedicine. 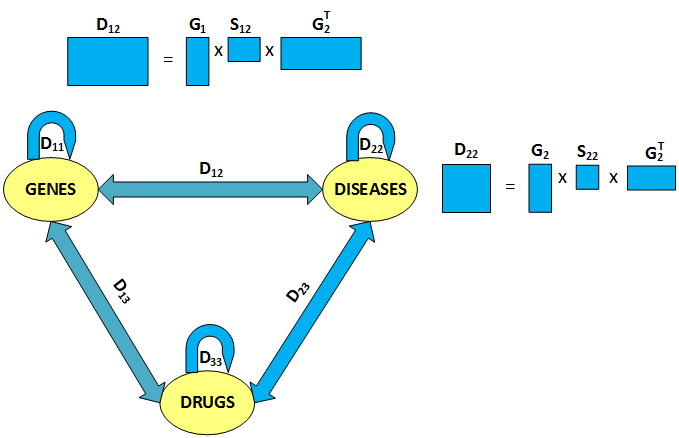 Non-Negative Matrix Tri-Factorization NMF applied to data associating genes, diseases and drugs can help (i) reconstructing data matrices Dij, (ii) co-clustering the data sets, and (iii) detecting new associations (triangles of connections) between the data sets. Week 3: programming the method. There are several extension of the underlying optimization problem which we can start working on. The student needs basic knowledge in C++. During the project he will get access to the local HPC machine.